Fitness is a lifelong commitment. It is essential to maintain healthy body weight to keep health risks at bay. Weight loss charts give you an idea of whether you are underweight, overweight or obese or just right. Being overweight can bring with it health problems such as diabetes, high blood pressure, cardiac ailments and elevated cholesterol levels. Weight loss needs sustained and determined effort. Gradual weight loss is beneficial for long-term loss of body fat. In this way, you can shed the fat off and keep it away. Typically weight loss programs aimed at shedding 1 -2 pounds per week are ideal. Find out how various weight loss calculators aid in estimating your calorie intake. Find out your healthy weight range for your height with this weight loss chart. You can then adjust your caloric intake according to your weight loss goal. Do not cut back the calories indiscriminately since it will lead to slow metabolism and other detrimental effects. Work out your caloric need with a professional dietician or doctor keeping in mind your desired body weight and lifestyle. You may need to adjust your caloric intake and exercise regimen accordingly. Weight loss strategies need to be geared to the degree of obesity. Online weight loss calculators help you in your weight loss and maintenance program. Online BMI calculators help you take stock of your weight vis-à-vis your height. You can find a free bmi calculator in our collection of articles here. Look up a reliable calorie calculator to find out how many calories you will burn off with different activities. These activity calculators can work as guides towards planning out your weight loss regimen to expend calories. You can then plan your exercise routine to lose fat, be it with brisk walking, jogging, swimming, skiing, yoga or routine day to day activities. Another effective calculator for weight watchers is the waist-hip-ratio calculator. It in an indicator of how your fat is stored, either round your waist or round your hips. The waist-hip-ratio of over 0.8 in women is considered undesirable. When there is more body fat stored around the stomach and abdomen, it indicates a higher risk factor for high blood pressure, sugar and cholesterol. Typically if you burn 500 calories per day more than consumed, you can shed a pound a week. 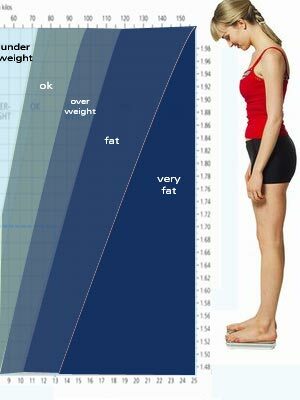 Ideally, body fat should not exceed 30% of total body weight for women. Weight charts give you a healthy weight range given your height and gender. It is derived from standard tables and government guidelines. But this cannot be used for women athletes or pregnant women. If you are an older woman or suffering from illness, the body weight chart may not be intended for you. Once you have identified your weight loss need, you must get a plan in place - one that you can adhere to and one that is healthy. Extremely low-calorie diets, skipping meals and weight loss pills are not the answer. Sensible eating, regular fitness regimen and positive frame of mind go a long way in weight loss management. Reducing calorie intake and exercising can surely lead to loss in weight. Check out a few weight loss tips that you can incorporate into your routine to shed the extra pounds off. 1. Drink plenty of water. It helps keep problems of digestion, urinary tract, chronic fatigue and constipation at bay. Surprisingly water can help prevent water retention by the body and improve muscle tone. Drinking warm water can rev up your metabolism. 2. Very low calorie diets can be counter- productive. Besides being impossible to maintain over a sustained period of time, extremely low calorie diet may throw the body into starvation mode and slow down metabolism. You may suffer headache and weakness. 3. Eat about 5 small meals a day spaced every 3 hours rather than 3 heavy meals. Skipping meals leads to slowing down of the body metabolism. Snack on healthy low fat vegetables and salads that are high on antioxidants, minerals and vitamins. 4. Get into a regular exercise routine for about 30 minutes about 4 - 5 times a week. Join a weight-loss club or fitness group. Keep a food journal to keep track of your eating patterns. 5. A positive frame of mind works wonders on most aspects of life. Weight loss programs are no exceptions. Stay at it and watch the excess weight. If you consume more calories than you expend, you will not lose fat. 6. Incorporate low-fat cooking into your daily lifestyle. Cut back on the fats, salt and sugar. Make healthy substitutes. For tips on low fat cooking tips, check out the adjacent link. Track your calories to check out your average daily consumption. Home cooked food can make weight loss management easier than eating out. First Published Date: 23 Jun 2006 Last modified Date: April 18 2019 This page may have been updated recently as new information is available or the content may have been edited for better readability.